The generalized formula derived here by the author are applicable to locate any sphere, with a certain radius, resting in a vertex (corner) at which n no. of edges meet together at angle α between any two consecutive of them such as the vertex of platonic solids, any of two identical & diagonally opposite vertices of uniform polyhedrons with congruent right kite faces & the vertex of right pyramid with regular n-gonal base. These are also useful for filleting the faces meeting at the vertex of the polyhedron to best fit the sphere in that vertex. These are used to determine the distance of sphere from the vertex, distance of sphere from the edges, fillet radius of the faces etc. 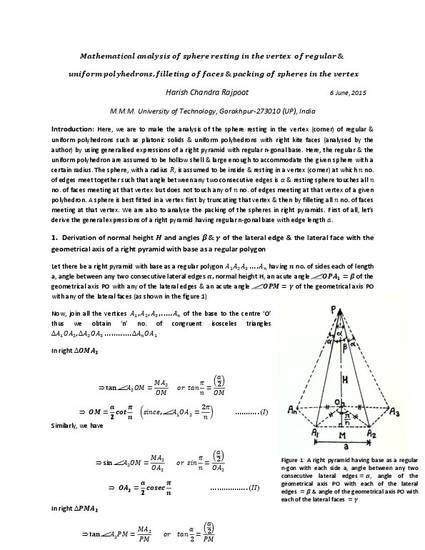 The formula have been generalized for packing the spheres in the vertices of right pyramids & all five platonic solids.